Chisel Nail Art - 3D Nail Stamps are the newest trend in today's nail art industry. Each package includes ten unique stamps that cut beautiful designs into uncured colored dipping powder. Use Chisel Nail Art Stamps with Beyond Couleurdip to create bright and colorful stamped nail designs. First, apply dipping base coat to nail bed to give the dipping powder a strong foundation. 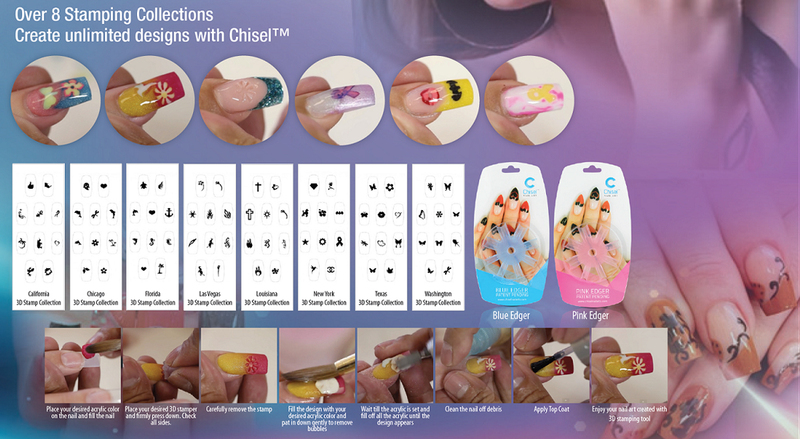 Chisel Nail Art Stamps are available in eight unique collections. Choose the collection that best fits your style.